From windbreakers and winter jackets to waterproof jackets and great coats, the selection of men's outerwear items at Sharper Uniforms guarantees a style that's right for every staff member. All of our coats, jackets, windbreakers and fleeces are made to be both comfortable and durable - there's no question of whether or not they will perform under pressure. We make our products to withstand the elements beautifully and to last for years, no matter what the weather throws at them. Your staff will be comfortably warm outdoors while remaining polished and wholly professional. Averill's Sharper Uniforms' comprehensive selection of men's outerwear, waterproof jackets, windbreakers and fleece jackets makes us the only place to shop for all of your men's outerwear needs. 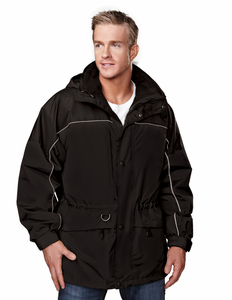 At Sharper Uniforms, we carry tried-and-true pieces such as fleece jackets, great coats, windbreakers and more. Whatever your staff needs to be comfortable, warm and dry in their outdoor service is available for fantastic low prices. We have all you need to outfit your staff for inclement conditions or outdoor service in chilly weather - from valets and doormen to salespeople and drivers, you can count on Sharper Uniforms to have the products you need at prices that won't break the bank. Browse our selection and choose from a variety of sizes, including big and tall sizes. We have the sizes and styles to accommodate any member of your team. Don't see exactly what you need? Give us a call to discuss custom items. Shop our selection today to save on all of the best hospitality outwear in the industry.